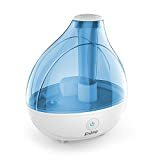 MistAire - Ultrasonic Cool Mist Humidifier: Humidifier Review • The Air Geeks, reviews of air conditioners, dehumidifiers and air purifiers. If you are looking for an affordable humidifier for a mid-sized room like an office or your bedroom, then MistAire Ultrasonic Cool Mist Humidifier could be the perfect one that matches such a description. At its price, this humidifier does a great job in ensuring that air you breath is refreshed and we would recommend you to give it a try. This cool mist humidifier could prove important, especially during the summer when the air feels somewhat hot. One of the most amazing features of this product is its portability and its elegant look and feel. This California-based company does a great job to ensure a sleek premium design which looks very well on any furniture setting. At only about 2 pounds, you can move it anywhere you please without needing any much help. The tank has a capacity of 1.5 liters only and this ensures it is light enough to be placed anywhere even on a table-top. It is almost maintenance-free except for the occasional cleaning of the water tank which is usually fairly simple and easy. In addition to dozens of videos online, it does also come with an instruction manual for most everything you might require to maintain the humidifier and keep it in perfect shape. Once in a while, you can use some vinegar and a brush to clean the water tank and it will regain its new look again. MistAire Ultrasonic Cool Mist Humidifier is especially great during the summer and it can be a save you from constant coughs due to an irritated throat, cracked-lips, and asthma flare-ups that are caused by dry air. If you have a snoring partner, this humidifier can help with that since moisturized nasal passage ensures adequate flow of air thus reducing the loudness of the annoying sound. Its Ultrasonic Cool Moisture Technology ensures 16 hours of continuous operation without needing to refill it again so you can focus on other important tasks. It also comes with high and low-speed settings which you can configure to suit your own liking. Everything is well labeled and self-explanatory. This humidifier also takes into account safety measures to ensure that it does not pose threat to your kids and pets. Armed with an Automatic Shut-Off feature, it ensures that the motor does not run when the tanks are empty or have been disassembled. If run for a long time without a load, motors tend to overheat and this can pose a fire hazard to the house or burns kids and even pets. Its 360-Degree Mist Nozzle is very handy if you want to direct mist to certain areas of the room as the nozzle can be rotated in any direction without having to move the entire thing. Another cool feature of this appliance is its noise level. The team behind this design have managed to ensure that the item is whisper-quiet when operating. This means that you get to sleep comfortably without having to worry about constantly waking up in the night due to loud noise and vibrations. It also means you can place it in the kids’ room without having to worry about its noise level. This product also comes with an optional night light that is very soothing during the night and can help to induce sleep. This product is very affordable and at under $35, you don’t want to miss out on the opportunity to own one for yourself. It is very popular and a lot of people recommend it for its cool features at such an affordable price. You won’t have to dig deep into your pockets to own one for yourself. Breath refreshed air at an affordable price! Room Coverage 175 sq. ft.
Its 1.5-liter water tank ensures you get continuous quality air at 150 millimeters per hour for a whopping 16 hours on low setting. This means you can leave it overnight and sleep comfortably without having to wake up in the night to refill it. It’s whisper-quiet so you can listen to your favorite shows without hearing the vibrating motor. Even after you turn off the LED lights, it does not turn off completely and this can be a nuisance especially for those who like completely dark rooms at night. It does not use a filter hence white dust might settle on furniture after using it for sometime due to the accumulation of the mineral by-product left after the moisture in the air dries up. I've used it every night since purchasing, and it definitely does the trick! It's being used in my bedroom in my apartment, and the low setting is more than enough for me. My only issue is that while you can choose to have the night-light function active, you can't make the blue power button light turn off. It can be semi-bright in a pitch-black room, but it's completely manageable. As for the soft/hard water issue many people face, I haven't had any issues. The water in my apartment is pretty soft (do the dawn dish soap in a water bottle method to check) but I also make sure to rinse out the tank every morning and let it air dry during the day. I haven't seen the first trace of any mold and it definitely hasn't lost any functionality since I got it. " I love this humidifier! I bought the crane animal humidifiers for my son and used it for a few years before I got tired of all the components. This is easy to clean and use. It's relatively small compared to what else is out there. And it has a great nightlight feature. My only complaint is that the power/settings button makes a loud beep. Makes it annoying when you're caring for a sick kid. But no biggie, just gotta figure out what's your preferred setting before your little ones fall asleep. "